OVERVIEW -- With nearly absolute statistical certainty (greater than 3 standard deviations, or 99.7%), it can be CONFIRMED that Facebook has been engaging in selective censorship with regard tot ALL of Spencer C. Young's posts which are blocked from 95% of his 5,000 + FB friends and followers. Spencer C. Young's personal Facebook account has had the maximum number of friends allowable (5,000) for some time now. The preponderance of these friends are bright, well-informed activists who wish to effect meaningful positive change in America. He is also a member of a variety of activism oriented social groups on Facebook, which in aggregate exceed 6 million people. Logically, one would think Mr. Young's Facebook social platform alone should be especially robust in the dissemination of information among like-minded others and particularly effective in engaging "strength in numbers" levels of support from "We The People" oriented initiatives. However, this has oddly NOT been the case, and logically raises the question . . .
As presented herein and with what is effectively absolute certainty, it can be concluded that Facebook has undertaken actions in a decidedly clandestine manner to intentionally suppress, impede and/or otherwise censor the dissemination of information to and from Mr. Young, pursuant to a nefarious agenda that is linked to the cover-up of MorganStanleyGate. Over the past six months (May 1 to October 31, 2014) a random sample of my Facebook ("FB") friends' posts were selected, ALL of which I had ALSO shared with my FB Frriends. The sample size selected provides more than 99.7% confidence that the sample is statistically representative of ALL of my posts. However, taking into account that I have on average 70% more FB friends than those included in this sample (i.e., my 5,000 friends vis-a-vis their average of 2,940 FB friends), I can say with greater than 99.7% certainty that MY posts in the selected sample SHOULD HAVE HAD ON AVERAGE. . . I then took a less statistically precise look at posts my FB friends made, which did NOT show up on my news-feed and vice-versa. The lack of statistical precision is because one can realistically only test this for the most recent posts as Facebook has established operational algorithms that make gaining access to dated posts prohibitively time-consuming. Nevertheless, this less statistically relevant approach yielded a similar result of . . .
my FB Friends and I. Moreover, when I had solicited my Facebook Friends to sign a petition calling for criminal investigations on three notoriously corrupt public officials ("Petition for Investigation"), I found that only 4% of my Facebook Friends actually received the message soliciting their support, or in other words . . . In the aforementioned Petition for Investigation, I had also solicited support from fellow members of my FB Social Groups. Specifically, I had posted requests to sign the Petition on a dozen of the larger social groups, which in aggregate represented over 2 million like minded activists who are supportive of exposing and eradicating fraud and corruption and in dismantling rigged systems designed to reward an undeserving few at the expense of oppressing an unwitting vast many. These included such social groups as "Occupy Wall Street" , "True World News" and the "NWO/Illuminati Resistance Network. And how many of these 2 million + activists signed the Petition? None. In follow-up inquiries with a variety of my FB friends who are ALSO members of these Social Groups, they ALL said they were aware of my solicitation despite having personalized parameters that call for notifications of posts made by their FB Friends. This indicates nefarious actions were undertaken that are even more draconian and one to conclude . . .
networks to which I belong. With greater that 99.7% statistical certainty, one can reasonably CONCLUDE . . .
from being shared with supportive others. QUESTION: This naturally begs the question as to WHY Facebook would do something so diabolically deceptive and sinister? And this is not the first time Facebook was caught red-handed in constraining my connecting with like-minded activists, they have merely changed to a more disguised form of it. The ANSWER lies in a fellow named Erskine B. Bowles, whom I knew from when I lived in Chapel Hill North Carolina where I owned several commercial properties in its downtown business section. During that time Mr. Bowles was President of the University of North Carolina at Chapel Hill ("UNC"). Importantly, Mr. Bowles has long been a close friend of John Mack (then the CEO of Morgan Stanley). Numerous sources have indicated Mr. Bowles exerted his influence in the community to help instigate a vicious smear campaign against me in North Carolina so as to coincide with a viciously coordinated assault of commercial sabotage on a retail/office complex known as The Courtyard of Chapel Hill. Mr. Bowles' direct contribution to this effort included the issuance of FOURTEEN overwhelmingly malicious articles that were chock-full of bombastic lies in the UNC School Newspaper, "The Daily Tar Heel". These articles were coordinated with three other local newspapers (The Chapel Hill News, The Herald Sun and News & Observer) such that SIXTY-FIVE patently false articles were issued over a 15 month period that began at the end of July 2007. Now honestly, who ever heard of a college newspaper getting involved in the politics and businesses of the city it was located in, particularly since it had no association with the college, and was NOT a place frequented by its students. For instance, during my time at Cornell University, The Cornell Daily Sun NEVER printed any such articles, and nor has The Daily Tar Heel similarly done so since then. Acts of Censorship . . .
. . . where the final element to the answer is this . . . These diabolical efforts to suppress the explosive facts and reality that is MorganStanleyGate, and is ALSO linked with the efforts of a corrupt judge in rural Kansas (Ron L. Svaty) from a county I have NEVER stepped foot in, and is behind an audacious Paternity Fraud from a state with no jurisdiction for a child that is NOT mine in an outrageous effort to secure fraud-based monies for a five-time felon in North Carolina (Leah R. Krier). This felon executed FIVE episodes of grand larceny entailing the theft of property valued at over $200,000 with the corrupt and illicit assistance of her romantic interest (at the time), a retired North Carolina judge (David Q. LaBarre). And this property was involuntarily placed in storage as a result of "the worst bank foreclosure fraud in US history", which culminated in my being violently assaulted by the Orange County (NC) Sheriff SWAT team (also profoundly corrupt) and evicted from my Chapel Hill residence, a FRAUDULENT action that was predicated on a mortgage that had been PAID-IN-FULL ! 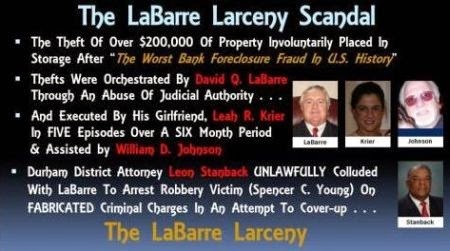 When LaBarre and his girlfriend were outed in a detailed criminal indictment, LaBarre's longtime friend and colleague (then the acting Durham NC District Attorney) Leon Stanback orchestrated my FALSE arrest via U.S. 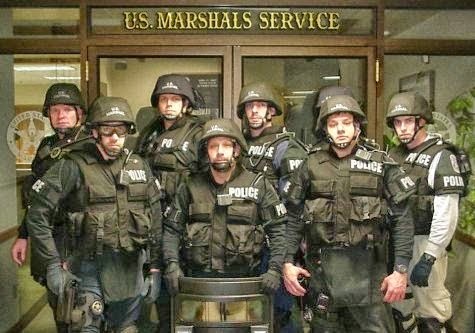 Marshal SWAT team on charges that were made up out of thin air. These charges were later dismissed as meritless, but not until I had been ILLEGALLY incarcerated for 127 days during which time I was effectively denied access to legal counsel and UNLAWFULLY denied bail ! Most recently, the corrupt judge in rural Kansas (i.e., Svaty) garnished my bank account at JPMorgan Chase, who despite being provided overwhelming evidence that this is a criminal fraud, they have cooperated in the implementing the pernicious effects of this crime, the same way a compliant thug would obey the orders of his criminal boss. JPMorgan Chase has chosen not to INVESTIGATE THE OBVIOUS. Now why would JPMorgan Chase blindly cooperate in an OBVOUS Paternity Fraud perpetrated by a corrupt district court judge in Ellsworth County, Kansas, a state with no jurisdiction whatsoever? 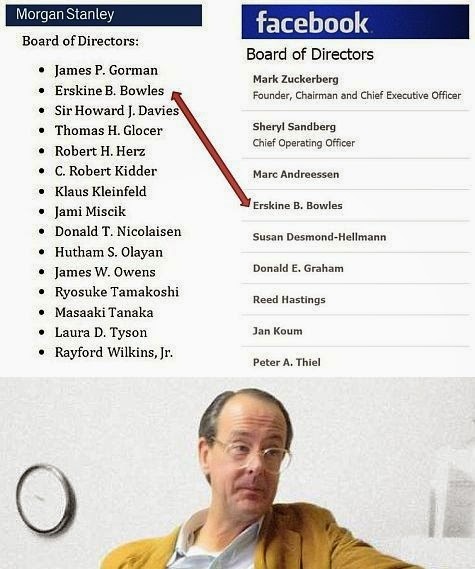 The answer may lie in who is on the Board of Directors of JPMorgan Chase -- it is Erskine Bowles' wife (who formerly worked at Morgan Stanley, and also where she and Erskine met). Her name is . . .
Now what makes this remarkably ludicrous and deeply conflicted arrangement (in place for many years) REALLY stink to high heaven is made clear by a simple question . . .
As I am a former executive of BOTH Morgan Stanley AND JPMorgan, here's a list (off the top of my head) of the GLOBAL business markets is which they COMPETE DIRECTLY AGAINST EACH OTHER . . .
And in the event a qualifying corollary is inserted along the lines of "unless otherwise determined by the Board", there is NO WAY Erskine and Crandall Bowles should be allowed to serve on the respective Boards of Morgan Stanley and JPMorgan Chase as they are head-to-head competitors in virtually EVERY market they serve. In other words, these directorships are beyond ABSURD. They represent an egregious CONFLICT OF INTEREST, a reckless violation of fiduciary responsibility to the respective public shareholders of BOTH banks, and are a mockery of generally accepted codes of business conduct and ethics. These spousal directorships also collectively violate any and all vestiges of common sense, and anyone who dares to suggest otherwise is a kakistocratic representative of a world gone mad.